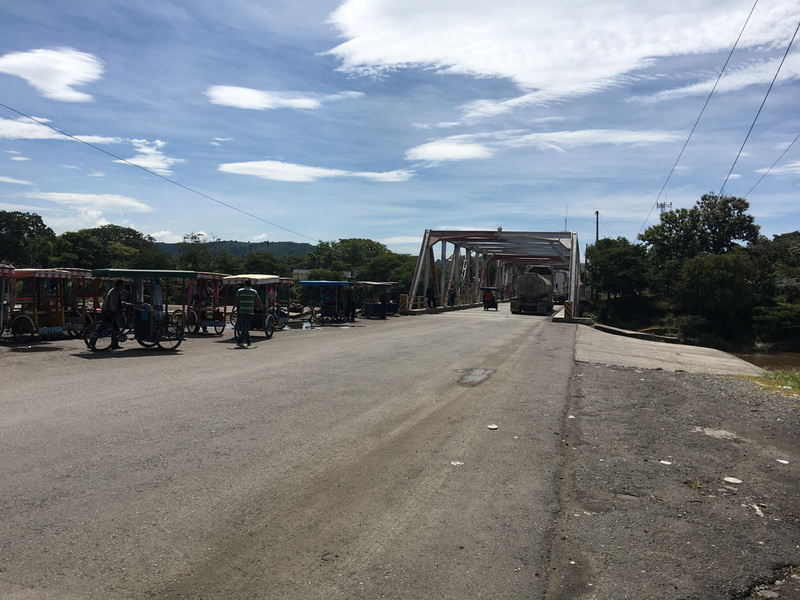 The objective of October 9th was to cross the border between Guatemala and El Salvador to get to the small town of El Tunco, located close to the middle of the country, on the ocean. 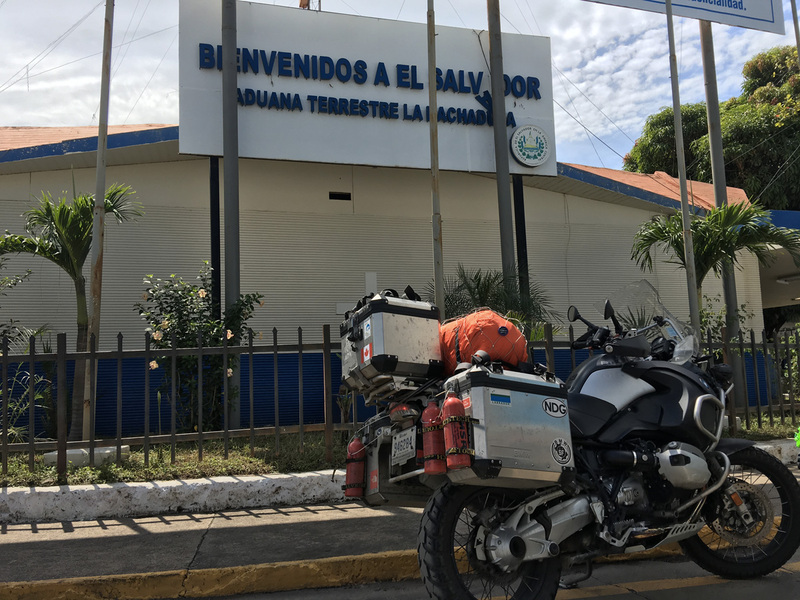 The road to the city of the Hachadura, Salvator, where the border crossing I want to go thru is located, is correct with mostly country portions and a little bit of a highway. What strikes me most is a difference between a large part of the roads I have travelled in the US and Mexico. Here, everything is green! No drought problems and rivers are full of water, in contrast to several places where I’ve crossed bridges on top of completely dry river beds. 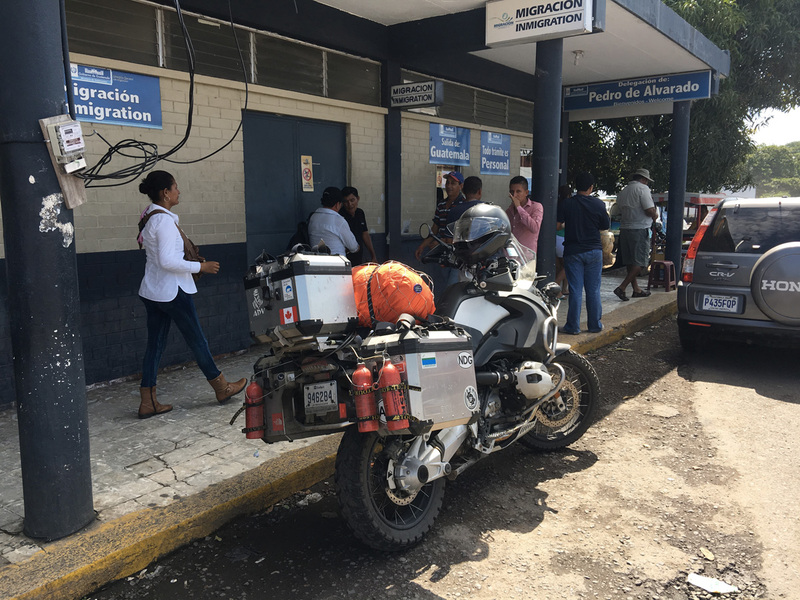 Guatemala’s exit procedure is relatively simple and worked even if I did it in reverse! 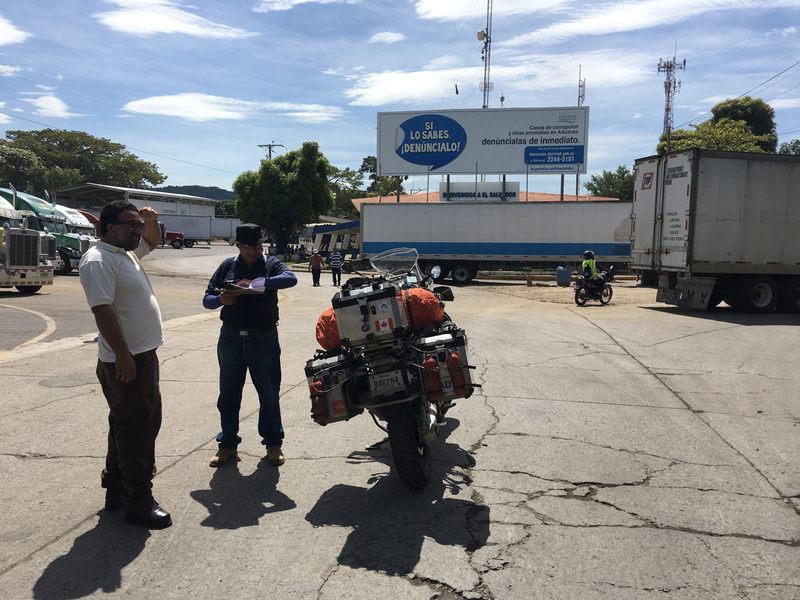 In fact, I went to immigration to get stamped out and get a small document to present to the Salvadorian officials but I had to pass through customs first to cancel my import documents for the bike. The office was hard to find, because you must pass thru a small hallway and go into the opposite lane (the one for incoming traffic) to locate the place. I did not wait. I provided a copy of the documents that I had along with an additional photocopy of my driver’s licence, my registration and my passport. The lady came to see my bike and everything was done quickly, with a nice smile and a few pleasantries! Some people in the street tried to help me or offered to exchange money, but we’re not too pushy. I then crossed a bridge and passed some trucks waiting in line. 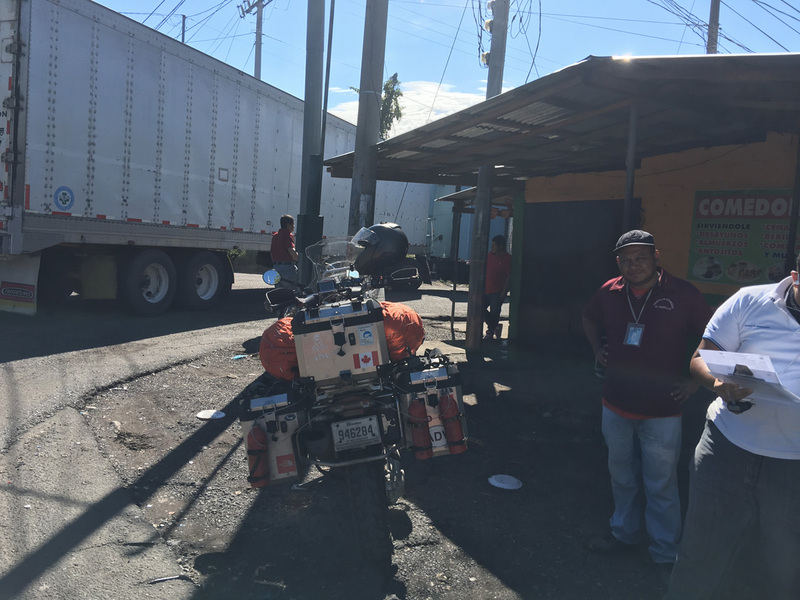 Officers asked me to show documents from Guatemala directly on the street and told me the next place to go was for my bike (adouana). They immediately took care of me, but a computer system issue delayed the proceedings. After an hour of waiting, I could move on. No charge for this crossing. The road Salvator is badly damaged with huge potholes that require constant concentration. Shaded portions by tree branches are not obvious, because it becomes difficult to detect them. 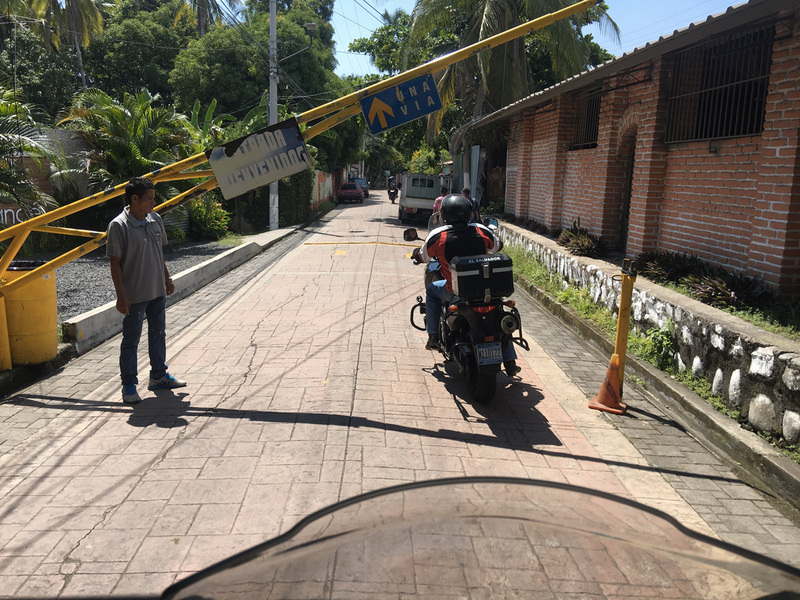 The small town of El Tunco greets me with a makeshift toll booth, but two bikers previously passed on the road arrive and start asking me lots of questions. One of them pays for the toll and here we go! They quickly leave, so I don’t really have the time to thank them properly, but I see them an hour later taking a beer in the village. They ride motorcycles similar to mine and are very intrigued by my trip. 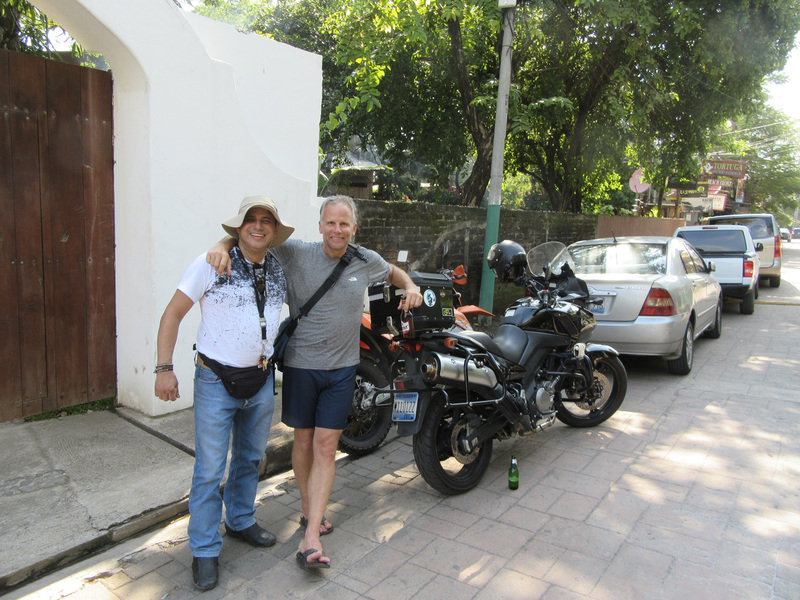 They are clearly passionate motorcycle riders and participate in many kinds of roads and enduro motorcycle meetings.. They start by offering me a beer, then 2, then 3, then 4 (you get the picture where this is going!). We also go for lunch and I’m completely drunk even before the 4:00 p.m. bells ring (and when it rang, it resonated quite strong in my head)! 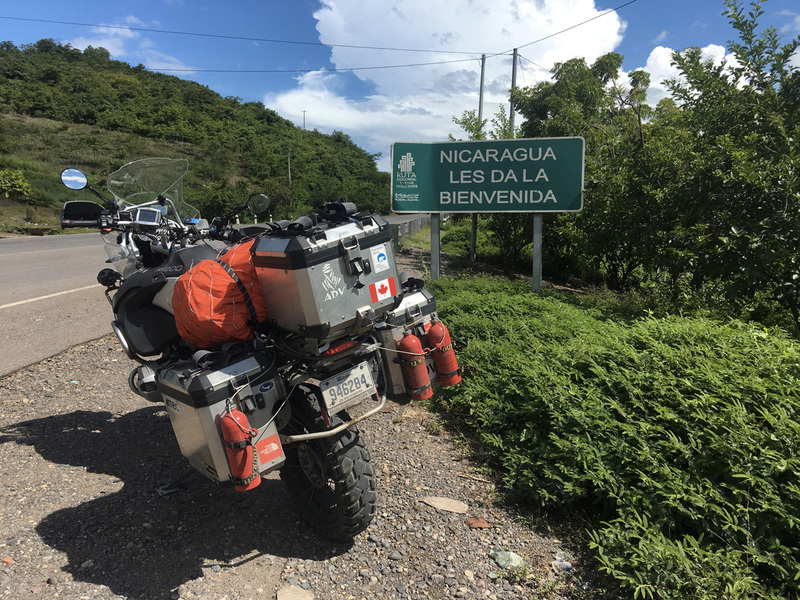 We talked motorcycles, travelling and, of course, what I should see and do going south. Unfortunately, they are not very enthusiastic about their country and recommended I go directly to Nicaragua ..
We left around 4:00 p.m. and I am unfortunately not good enough to start over again at 21:00 (they invited me to dinner) so I quietly prepare my ride for tomorrow and go to bed after taking a small and simple meal in the popular (and very cheap) restaurant of the village. Here is my little house for the evening at hotel Mopelia. 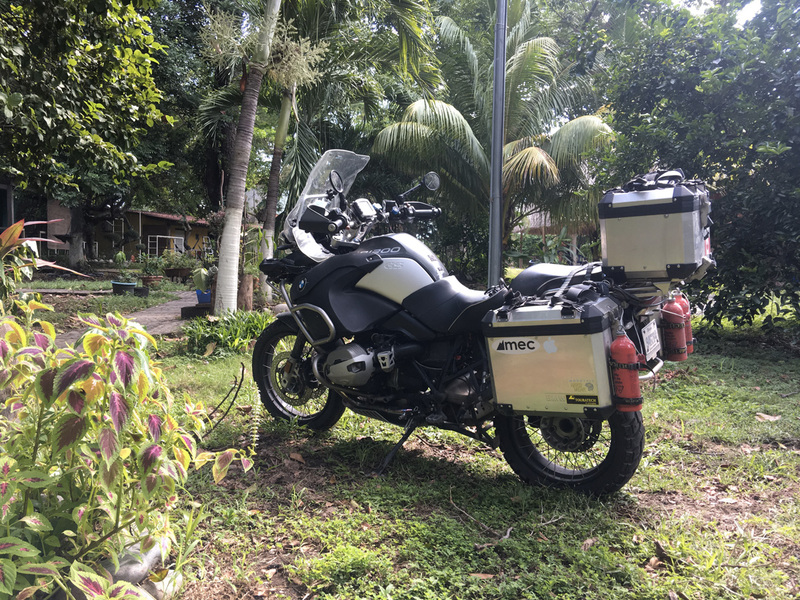 The 10th in the morning (Sunday), I wake up at 5:30 in order to have the road to myself to quickly get to Honduras with the objective to cross the entire country in 3 hours and the go to Leon in Nicaragua. A difficult task as it’a a minimum of 8 hours of driving, plus the time to cross 2 borders, with a somewhat bad reputation. 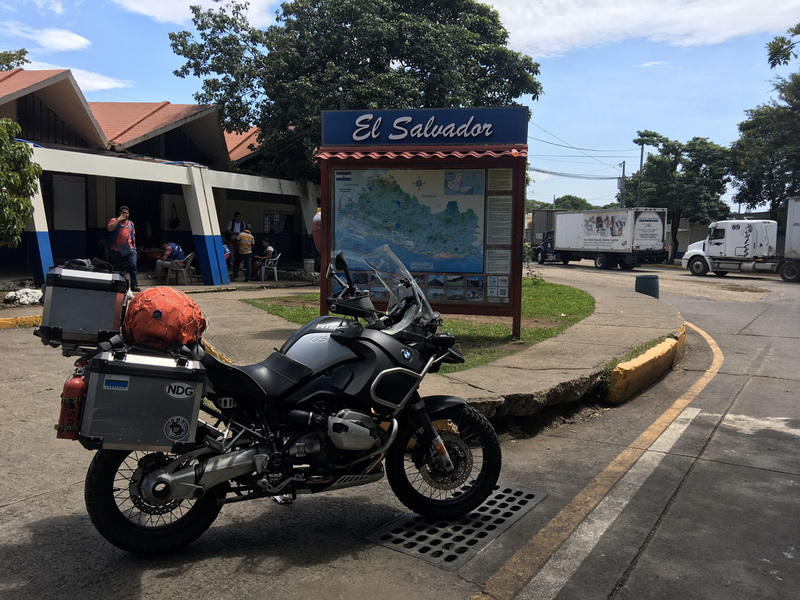 I arrived around 9:00 am at the first border, the one between El Salvator and Honduras. The procedure is relatively simple and takes about an hour. 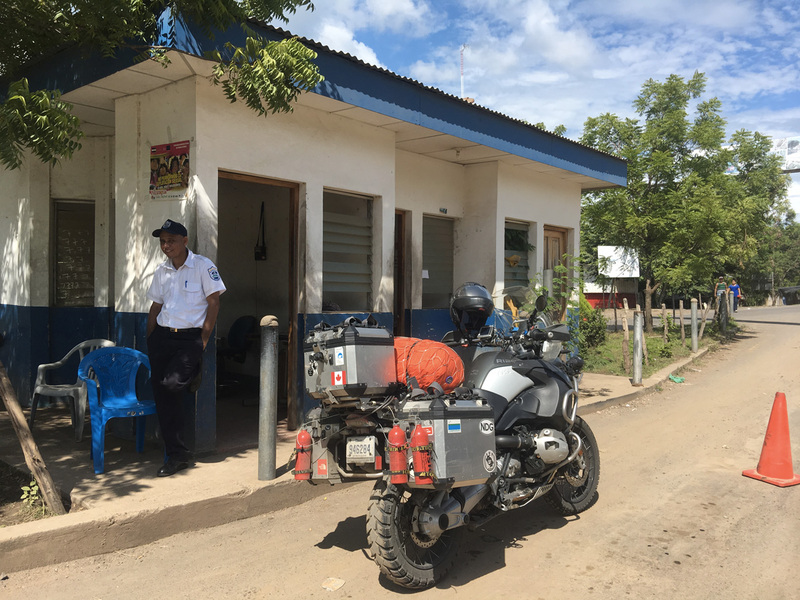 I am stopped at a small hut by agents who deal with Customs documentation and quickly, my temporary import permit is cancelled. 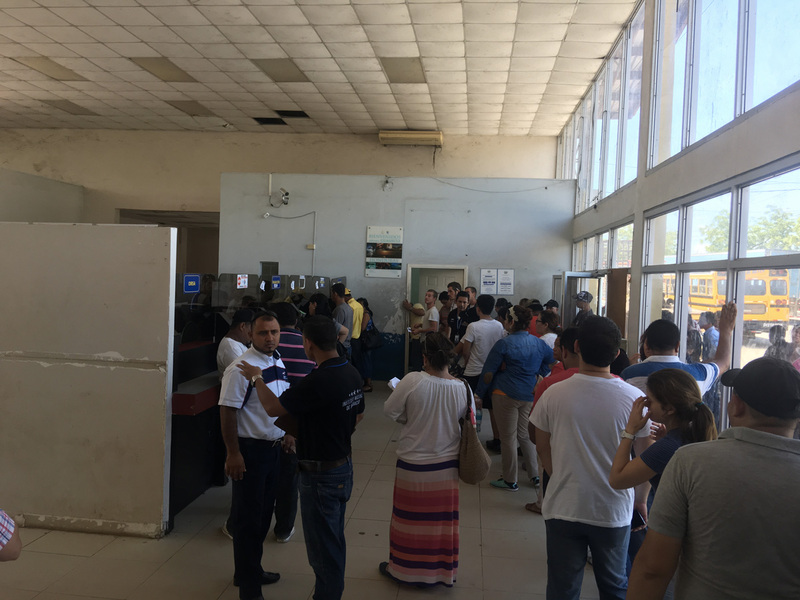 This occurs about 4 km north of the actual border, and immigration offices! So it’s important not to miss this spot. 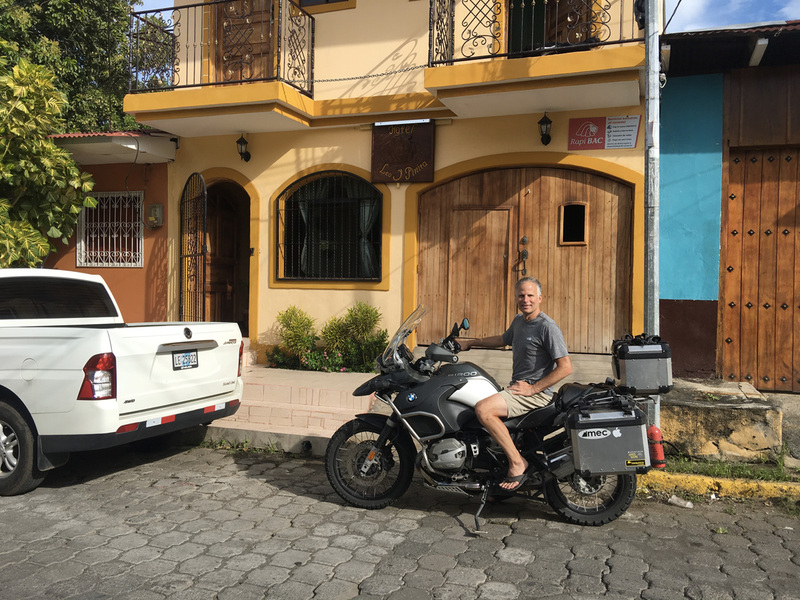 No charge to leave the country, but US $ 40 to enter the bike in Honduras and US $ 11 for myself. 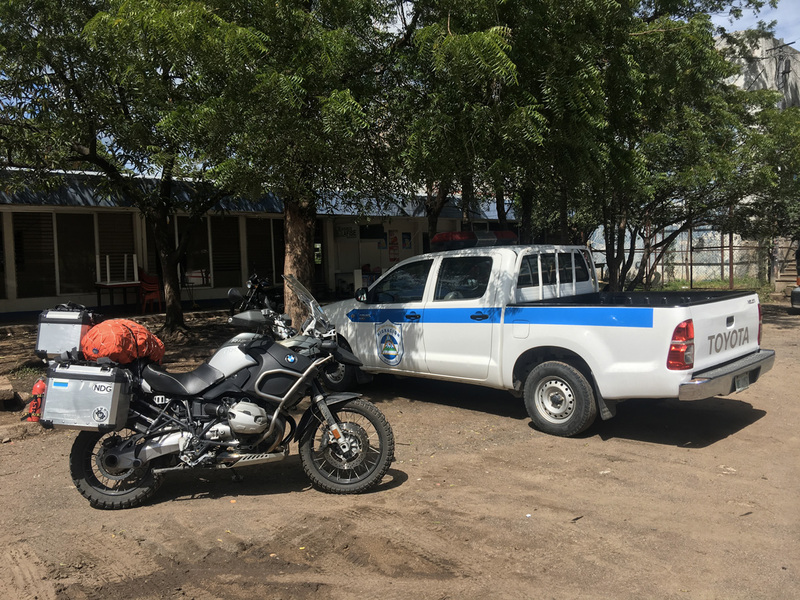 On entering the country, the building is impossible to miss and I enter what looks like a prison and process with my tourist permit and then, the import of the motorcycle. I’m a bit surprised at how thing when smoothly and quite rapidly. I can leave in 30 minutes. Except that the policeman in charge of validating my documentation, located 2 km north, notices an error. Indeed, the officer failed to sign a document for the bike import, so I have to go back and have it corrected. It is unbelievable the trouble that these countries give themselves with all the paperwork that officers must go thru. How to make things complicated? If you do not have the answer to this, just go to Central America! But wait just a minute… The next crossing was 10 times worse than what I had just survived! After a little more than 2 hours of driving in a miserably poor country, with roads just as bad as expected, I arrive in Wild, Wild West! 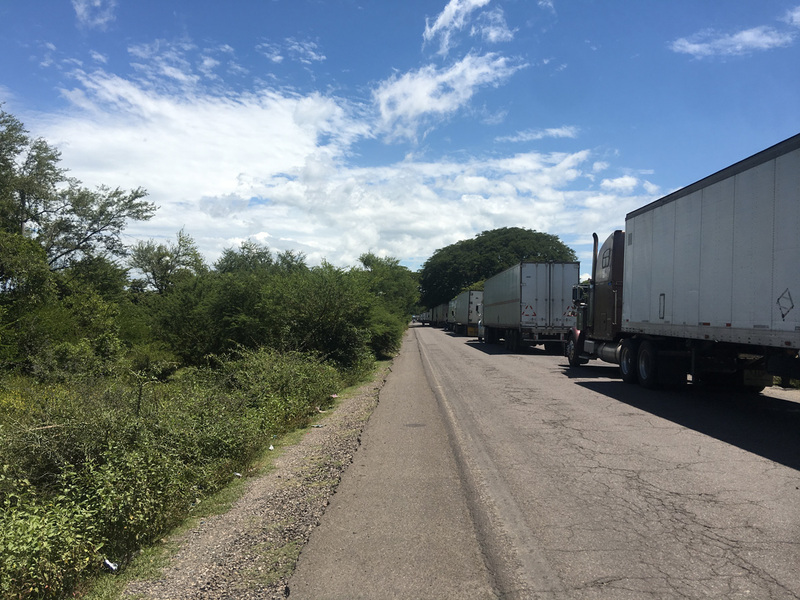 First, there is a line up of trucks, longer than 5 km before getting to the actual border. They are completely stopped. 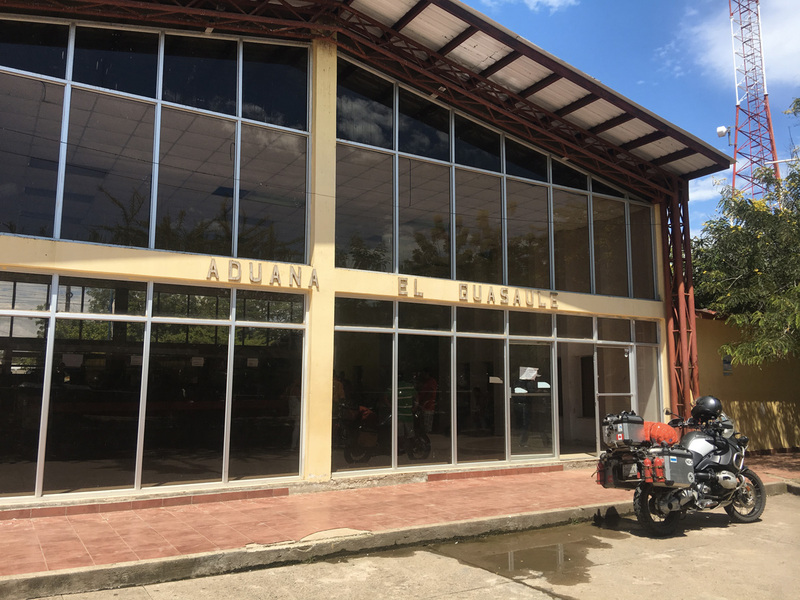 I take advantage of being on a bike and pass them on the opposite line to finally get to the building where the immigration and customs offices are. It is 37 degrees Celsius outside. I open the door and I feel a hot flash off air in my face. 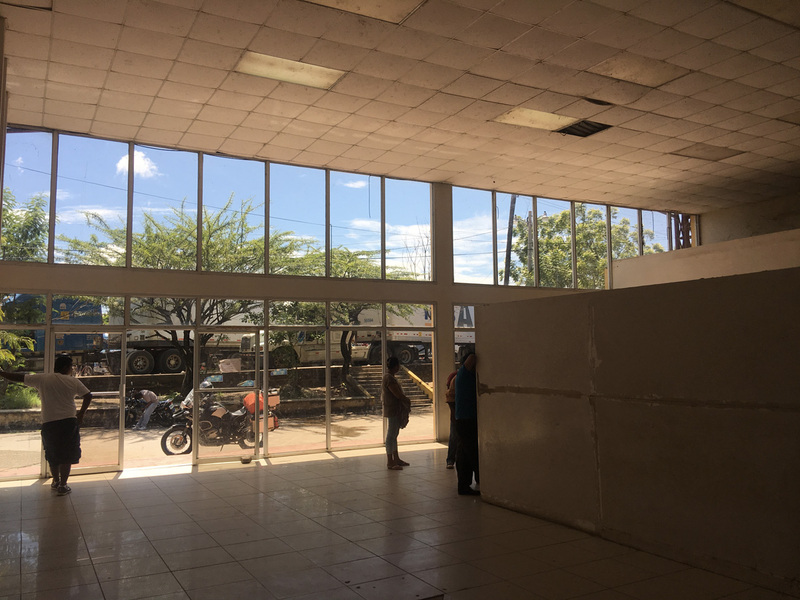 Inside, there is a high suspended ceiling that has not been cleaned for 20 years and four large air-conditioning units that no longer work and for probably as long if I you judge from the dirt that has accumulated for years, many years. I’m sure the temperature was around 40 and there was a lineup of about 75 people in front of me who sweat like crazy. These people are mostly dressed in shorts, skirts and t-shirt, but are sweating they their clothes. You can easily imagine how this small Canadian, wearing an insulated motorcycle suit feels! It was so hot and uncomfortable. 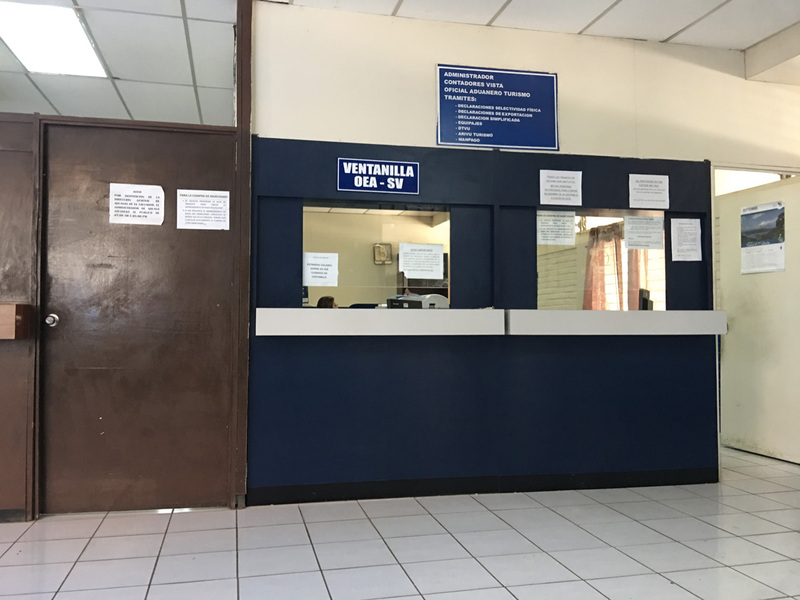 Immigration and customs procedures takes about 90 minutes and I can finally try to go towards Nicaragua with my pile of papers and forms. 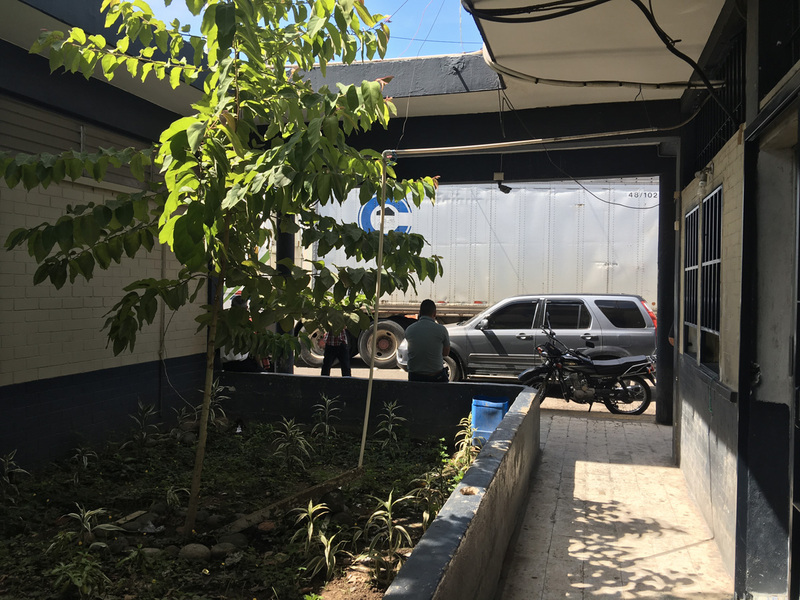 I leave south and another line of trucks appears before me and I have to work quite hard between them to get to the Nicaraguan border building, which, believe it or not, is even worse than the last! The procedure here is a series of queues and unnecessary documents filling that take forever. First, I’m getting intercept before the building by 2 customs officers. I need to show the Honduras documents to one, and my passport to the other. 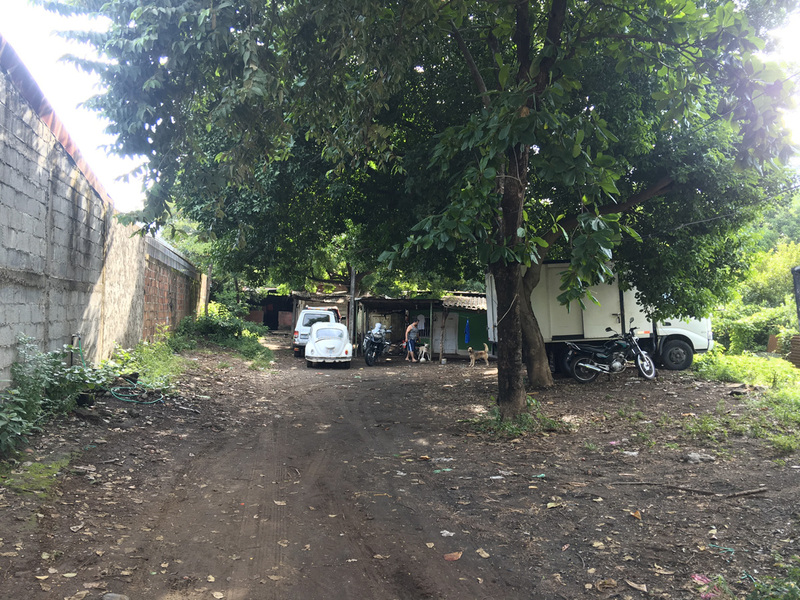 Then I’m asked a series of more or less formal questions like where you are going, where you come from, how long do you plan to stay here… Fortunately, I can communicate in their language because they do not speak a word of English! I always try to put a little humour in my answers and it always works pretty well. These people are human and their work is not easy. A small Canadian who makes them laugh with unexpected answers is unconventional and is a small break from their daily routine, and mine! 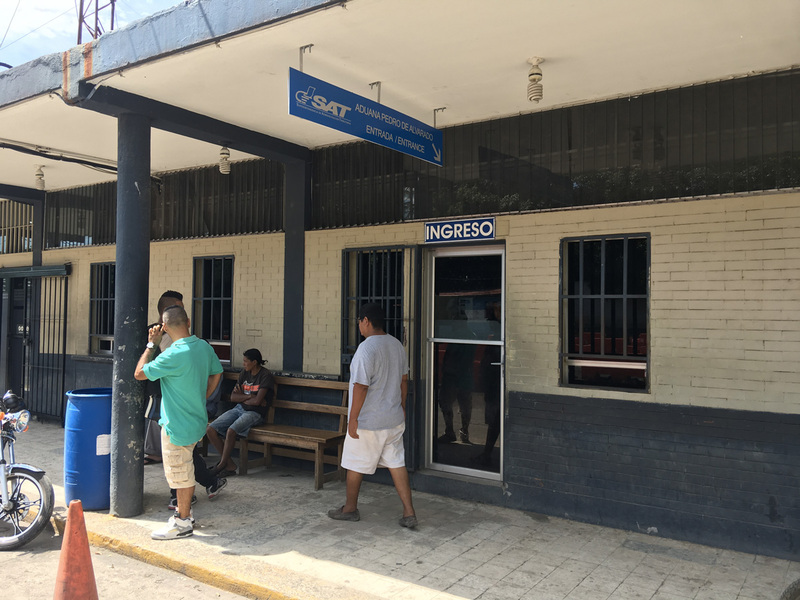 After successfully responded to all their questions, I feel liberated and think I’ done, but life is not so in Nicaragua. In fact, this was a pre-verification! They tell me to go in the actual offices located a few hundred metres away, in a lot made of dirt and mud, surrounded by makeshift wooden huts selling all kinds of junk. First step, get in line to have my tourist permit. The same questions again, multiple input into the computer and filling of paper form. Then, they gave me a form to fill myself. I did not have a pen with me. Well, nobody seems to have a pen to lend me and I have to give a dollar to a young kid that had been following me from the moment I got here. I fill out the form and go back to the counter where I have to wait 30 minutes to be told by the friendly and cheerful young man who greets me that I have to previously have my bike inspected an attendant who is outside. Great! I go looking for him and found him on the other side of the lot trying to having a good time with the street vendors! He looks at the bike without much interest, signs the form and tells me to go back inside where I have to go thru the lineup again to see my friend smiling! After 15 minutes of waiting again in the line, my smiling friend examines the documents and gives them to his partner, sitting on his left, in front of whom, you’ll have guessed, there is another queue! After a 20 minutes wait, he takes care of me and begins a series of scanning, copying, completion of forms, entries in its computer system, all while people are interrupting him for any sorts of reasons! This is until I take a physically position in front of the small opening in the glass and suggested to everyone, with a certain firmness in my tone, to let the guy finish with my case before disturbing him again! Another opportunity to interact with locals and to practise my Spanish! Finally, while the file seriously begins to get longer behind me, which always comes with people who grumble a bit, but above all, have the nice habit to get closer to you, a few centimetres every minute, as if it was going to speed things up! I have to finally ask the person behind me to back off a little, because it is warm enough as it is, and I certainly do not need his breath warming up my neck even more! Well, now you have to pay two fees. First, 10 US $. Easy! I give him a 10$ bill. 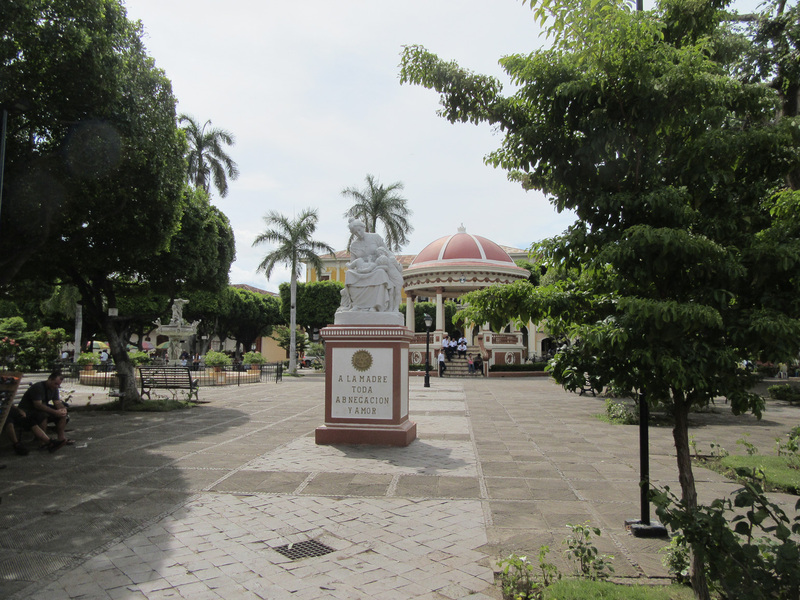 Then, I have to pay a 20 cordoba fee, the local currency of Nicaragua, which corresponds more or less to 2 US $, but I have none of that currency! I simply offer to pay with the 2 US dollars that I have in my hands, but not, it seems to be impossible, even if I make the previous payment in US a few seconds before! I’m left with asking my new best friend (read: lapdog) who’s been following me like from the beginning procedures, to go and get me 20 cordoba! He returned a few minutes later and I give him a nice extra $ for his efforts. He is happy as a king and I see a few minutes later, showing off to his friends outside of the building! Well, at least I’m done and I feel liberated again as I look forward to getting back on the bike to get some wind in my sweaty face! It is so hot! But not so fast Canadian boy! I’m told you also need insurance! I finally found the two girls in charge of selling this insurance. They are literally sleeping on a table set up outside, a few metres from the exit. I sit quietly beside them and ask, with my most serious voice possible, if the place to get insurance is here, in my best serious Spanish! They made the jump! 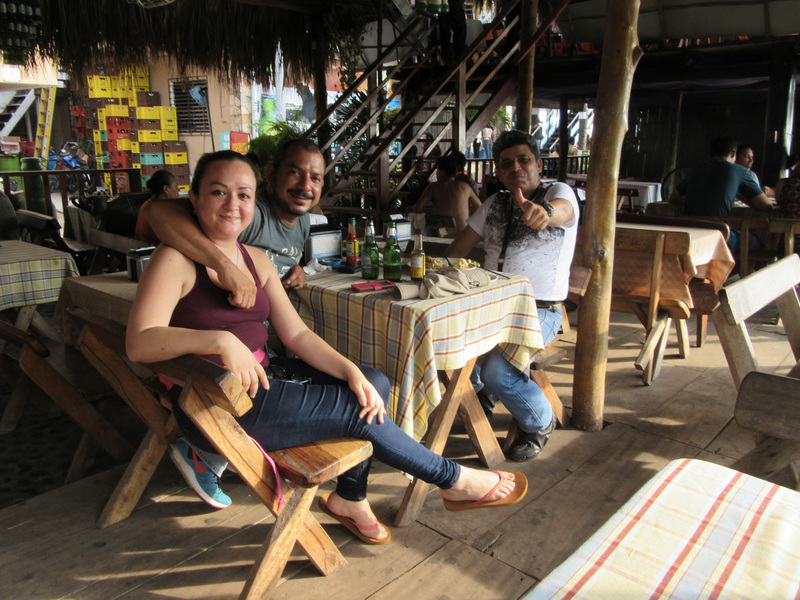 We laughed a lot and they actually asked many questions about my trip and they were very happy that I answered that the most beautiful country visited since my departure was, with no hesitation, Nicaragua! I had to pay $12 for a 30-day insurance. Would you be surprised if I told you that they had no change for my $20 bill! Again, my young friend runs off to look for changes. Another $ tip for the young sprinter! I then have to sneak in the opposite direction to the exit the parking lot, because the road is completely blocked by hundreds of trucks. I’m intercepted a kilometre south to validate the documents and I can finally hit the road. But no, that would be too easy! I’m intercepted again, a bit further, by the police as they must validate my insurance! Finally, and this time it’s true, I can start driving towards Leon. First observation, the road is much nicer and very different from the last two countries. Indeed, it is much larger and houses are usually a little farther from the road itself. 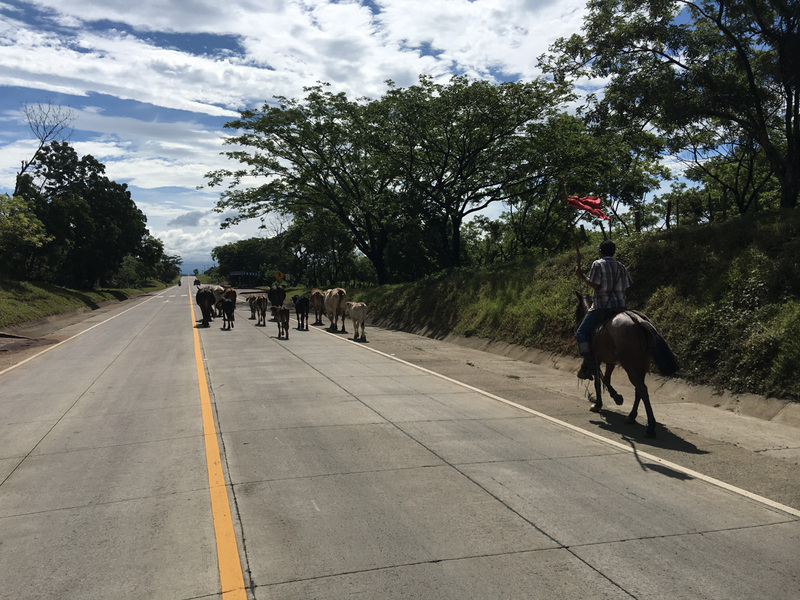 On each side, there is grass occupied by pedestrians, but most importantly, horses and cows. involved in the mowing the lawn! I am surprised by a fairly large storm, but I continue driving, slowing down a bit. I arrived in Léon around 4. Unfortunately it is not the surprise I was hoping for. 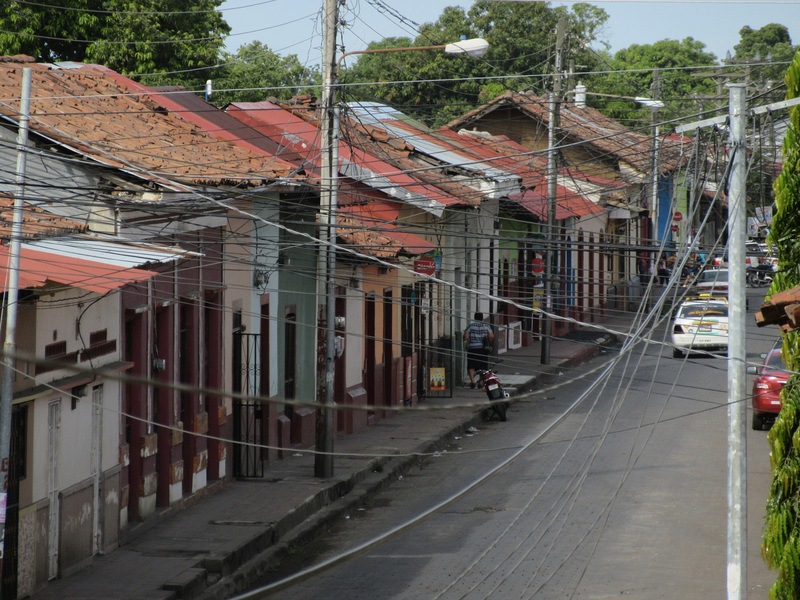 The lead-in streets to the cathedral and the central square are in a sorry state and buildings are similar. 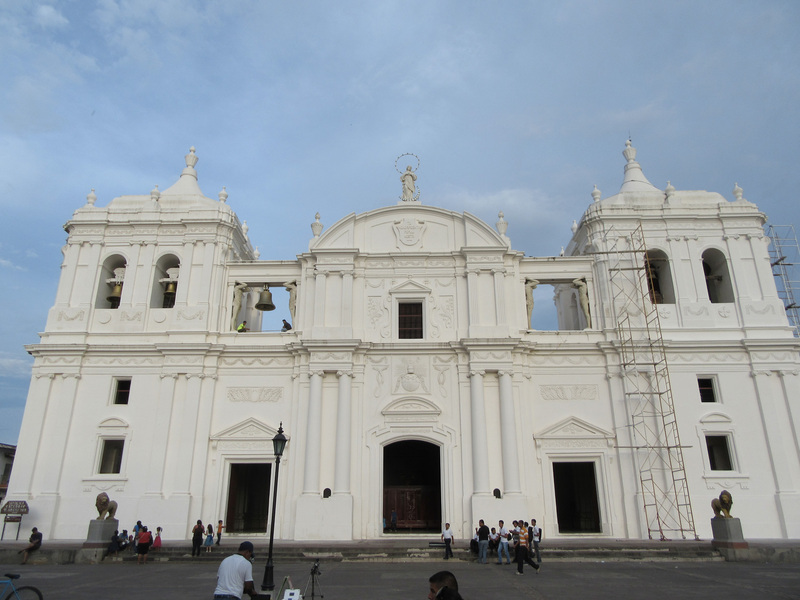 The centre is OK, but has nothing to do with the colonial cities visited in recent weeks. 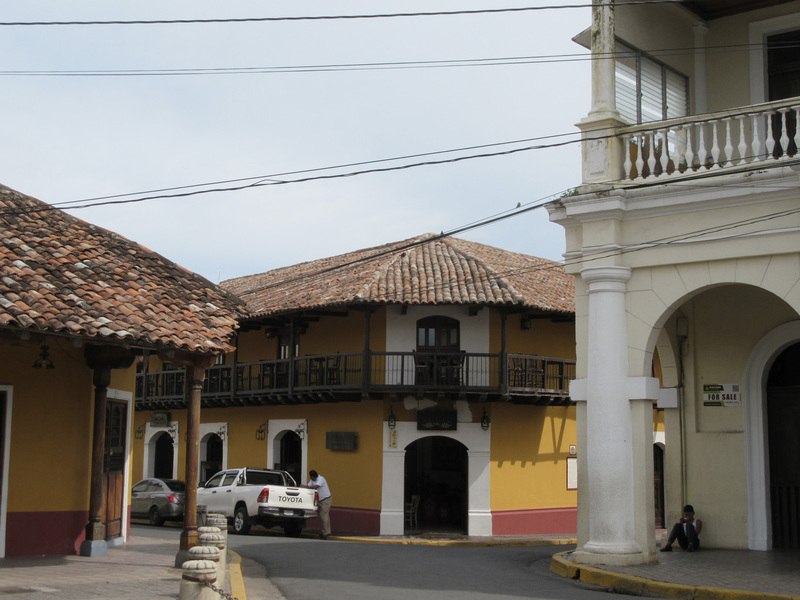 I stay in a hotel (should rather be considered a guesthouse or B & B) called Pinita y Leo. 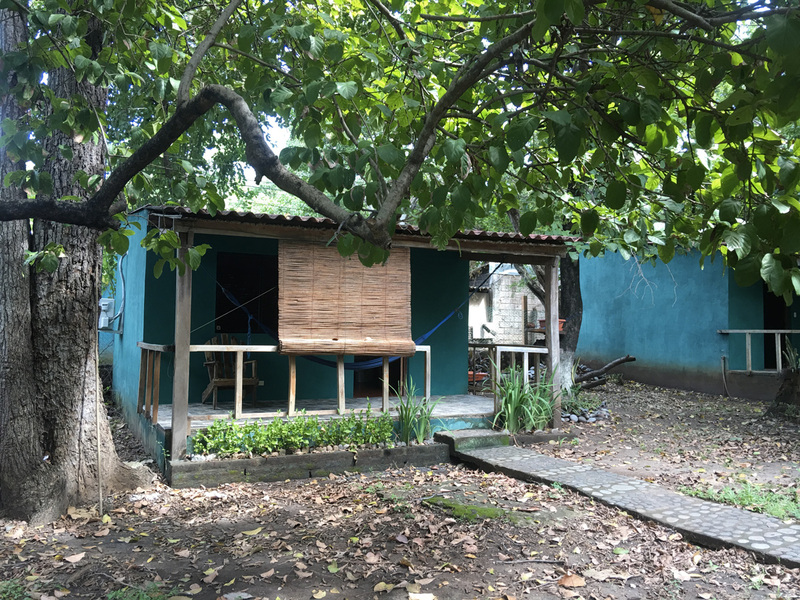 Very simple, very small rooms, but for $ 15, not so bad, and the owner is very friendly, welcoming and always offers to help to make your stay as pleasant as possible. Parking, however, is not very safe looking, but the bike was in one piece the next morning! On October 10th, I slowly make my way to Cordoba, which is less than 2 hours away. 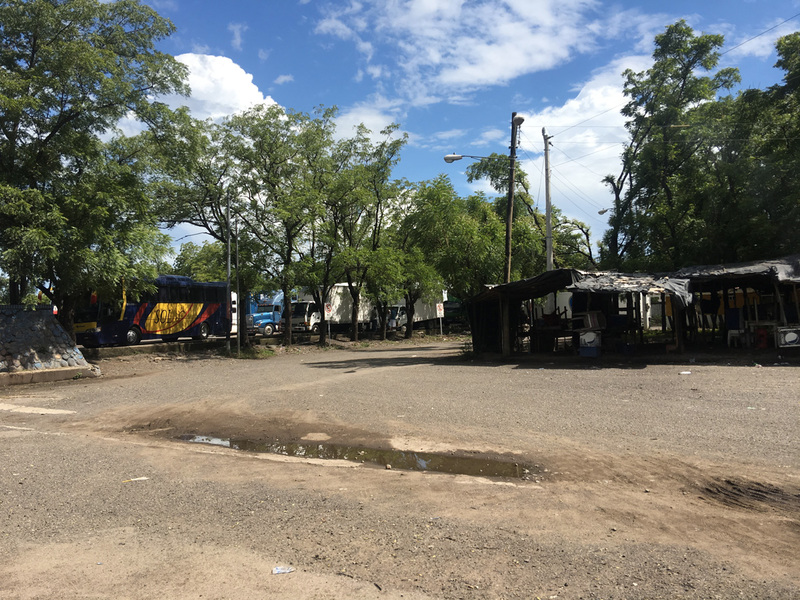 I start a small detour towards Managua, the capital of the country, but quickly changed my mind because of the traffic, too crazy for my relaxed state of mind for this day! Rural roads here are a little different as I mentioned earlier, but I find out that the main roads are gradually rebuilt with concrete, which is a good long-term investment for the country, and which has a very nice feel when driving on them! I also notice that drivers, outside of the cities, drive much slower, are more patients, and seem to respect the speed limits and other regulations. So I‘m often honked at when I pass on single lines. Another finding, people drive with the headlights off, bike included. My super HID front and auxiliary lights attract attention and appear to excite them, because I’m getting headlights calls every 10 minutes, with the hand signs pointing to my headlights! Well, so be it, these poor distracted drivers will have to get used to, because, for security reasons, I will not turn them off! It’s a bit ridiculous to ride motorcycles with the headlight off, and this, even during thunderstorms or in the evening, when it is almost impossible to see the vehicles in the opposite direction! 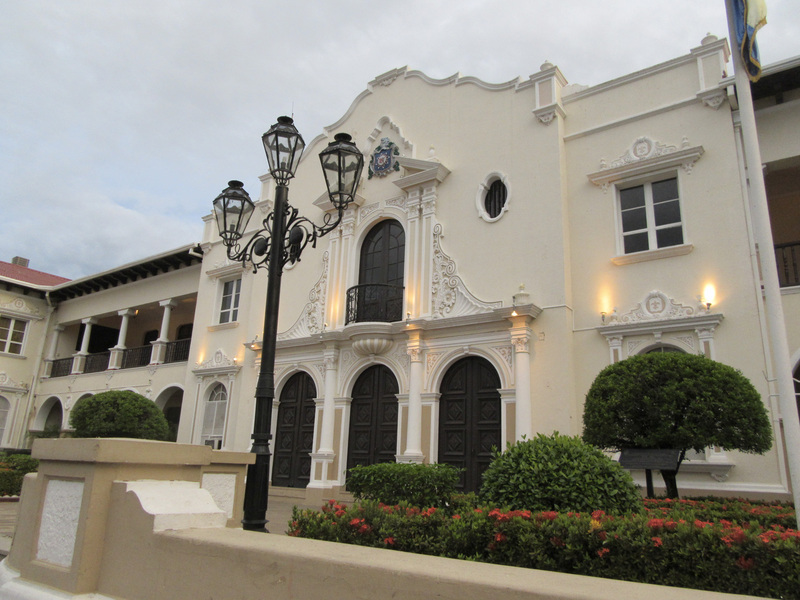 Cordoba gives a much better initial impression than Leon. 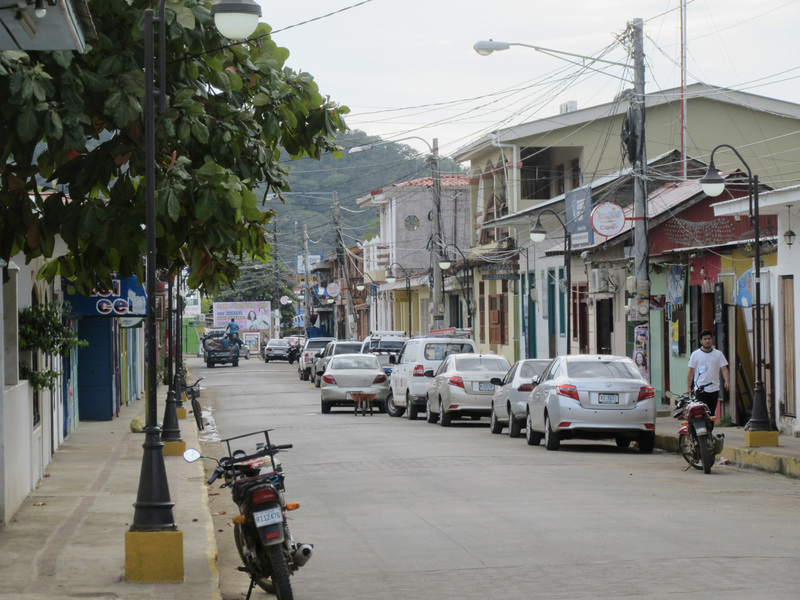 The city is much smaller and in better general condition. 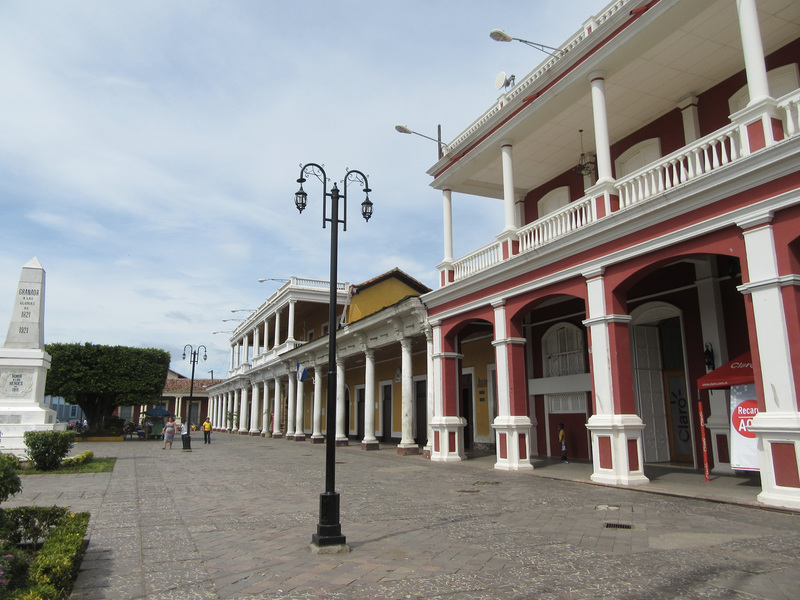 Several heritage buildings have been restored and the colonial aspect of several streets is great and visible as soon as I enter the central area. After a few tries, I see that the hotel prices here are, again, higher than in Mexico (I’m beginning to miss this country!). 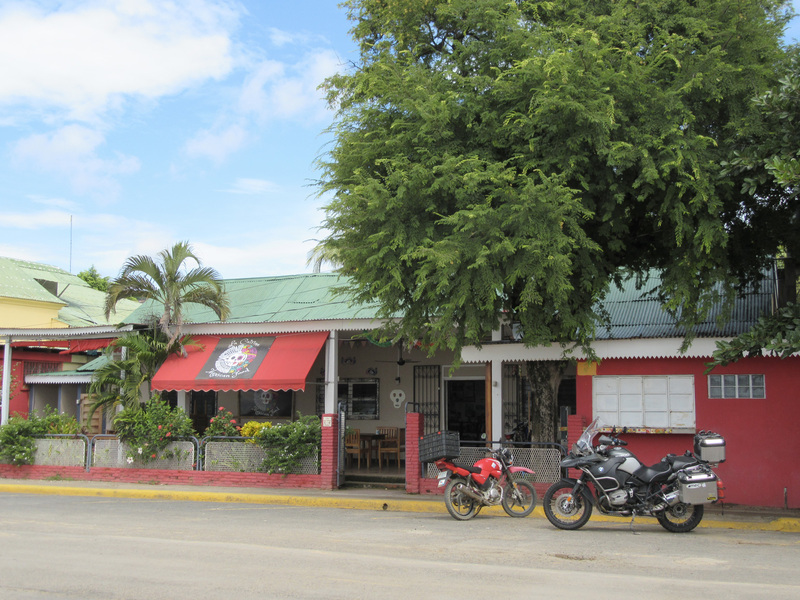 I end up finding a nice small place (Hotel de Sonrisas), managed by Sandra, who is from Alberta. 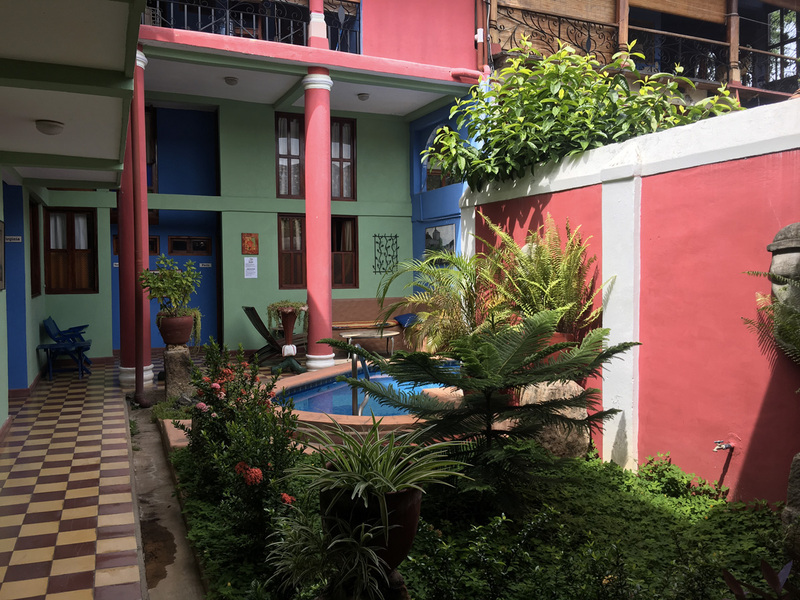 it’s very nicely located, with a nice extra clean and refreshing pool, and a quiet inner courtyard (US $ 35). The place does not offer parking, but I’m directed to a private location close by, which costs $2 for the night. I spend a quiet afternoon at the pool, because it is just too hot to walk around comfortably, and the evening walking quietly in the tourist area. The next morning is just as relaxed and I wander in the courtyard, the pool and the surrounding streets. 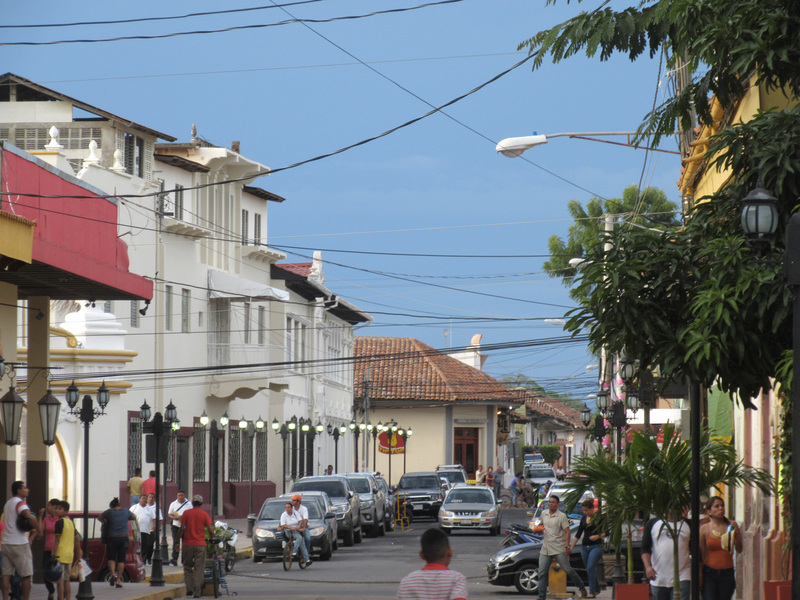 I leave for the ocean and the town of San Juan del Mar around 11:00 am. 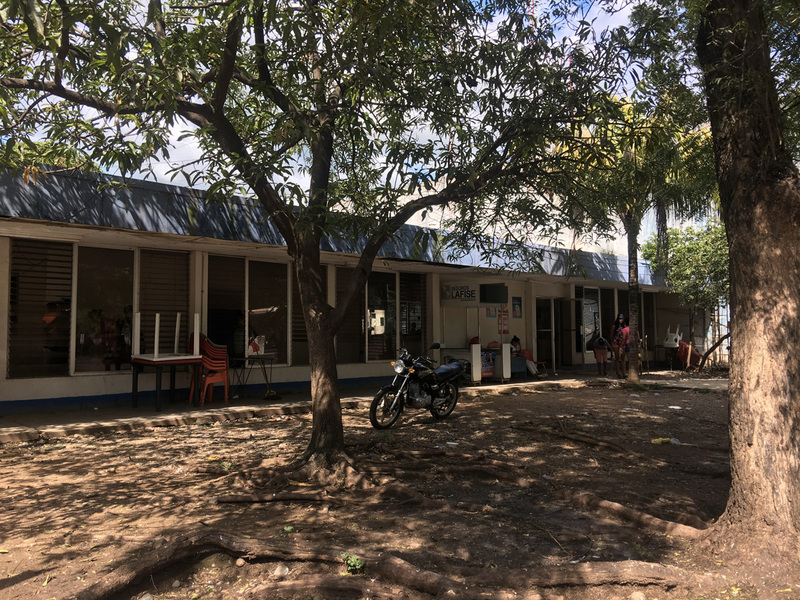 I arrived at Hostel Esperanza around 13:00. it’s the only place I’ve found at low cost. I do not need to tell you that I was the patriarch of the place! This is my first night in a youth hostel. This is not really for me, but if I want to respect my budget, there are, in certain occasions, like today, for which I have to make sacrifices. I do not regret this decision because to tell you the truth, the city is not so great, so might as well not spend too much money here. There is still a large bay with a beach, but it’s far from being a coup de coeur. I had to work hard to climb the 3 levels of the sidewalk but La Gorda is happy to get this view for the night! 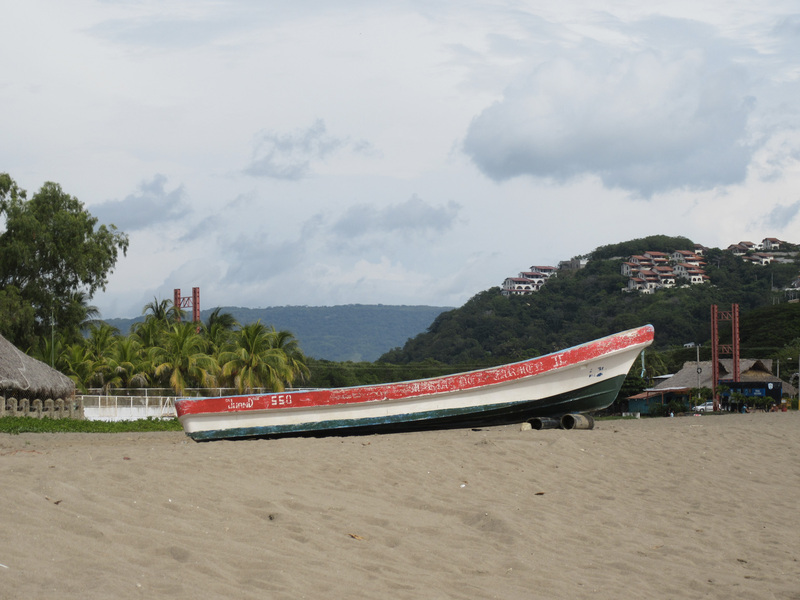 Tomorrow I leave for Costa Rica, where I hope to find a place to stop for a few days. 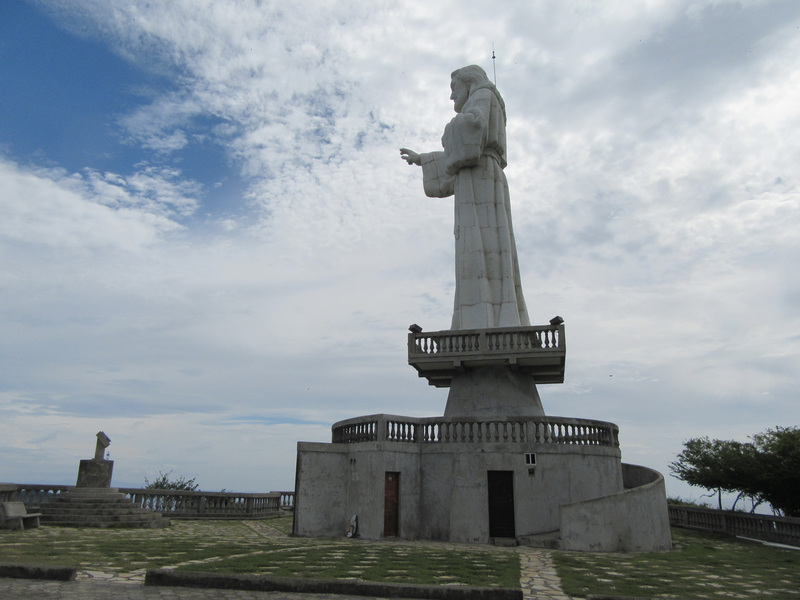 My friend Francis strongly suggested Monte Verde, but there are plenty of opportunities in this country, which doesn’t make it easy to make up my mind. 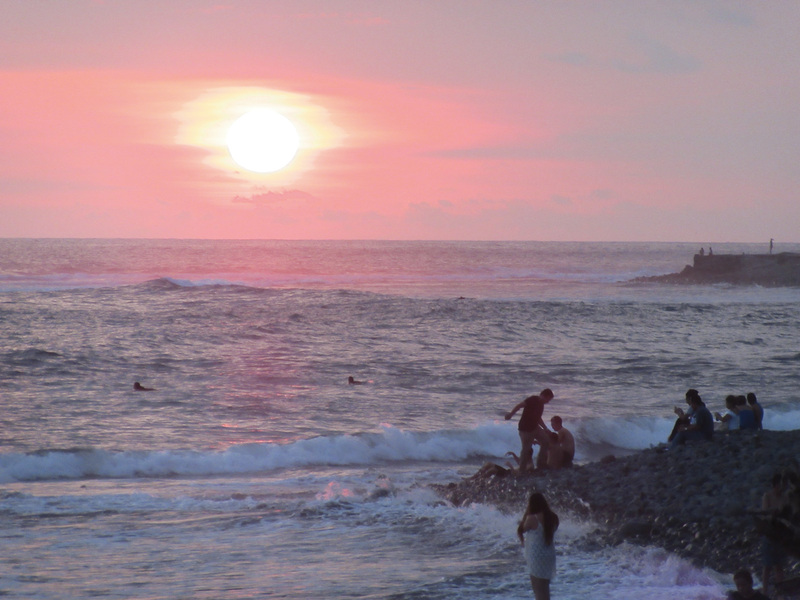 Also, I must consider the fact that Costa Rica is a bit expensive for long-term travellers. 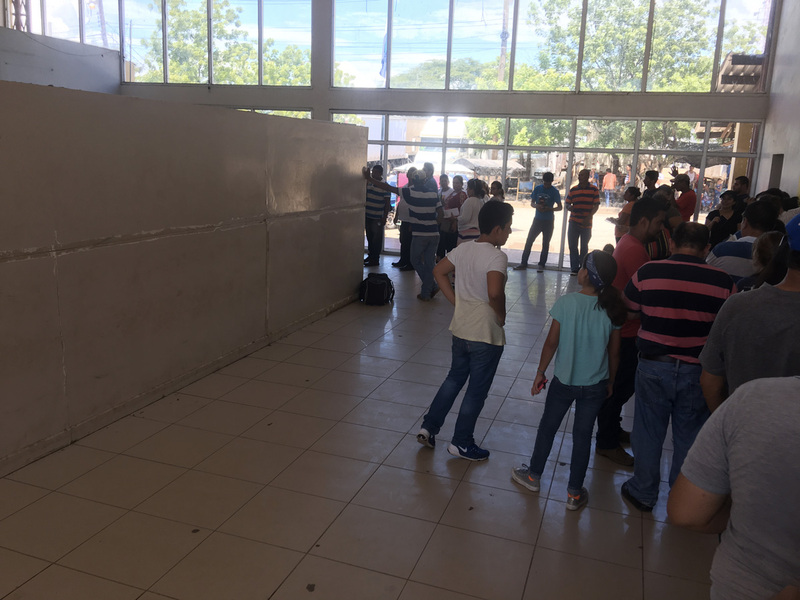 I have to go thru another border, but I’m getting used to it and quite frankly, even if this is not a very pleasant thing here, to date I’ve been dealing with people that, for the vast majority, are smiling, helping and doing only their jobs. My attitude is to take it all in with a smile, even if it is a somewhat absurd process. But it is part of the adventure so why not laugh about it rather than get depressed! 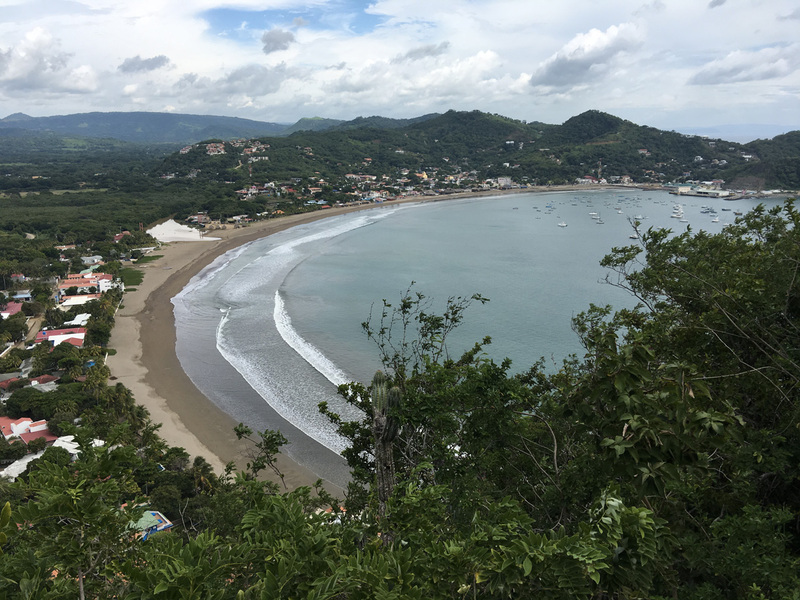 Day 31 to 35 - Costa Rica - Pura Vida and... Rain! 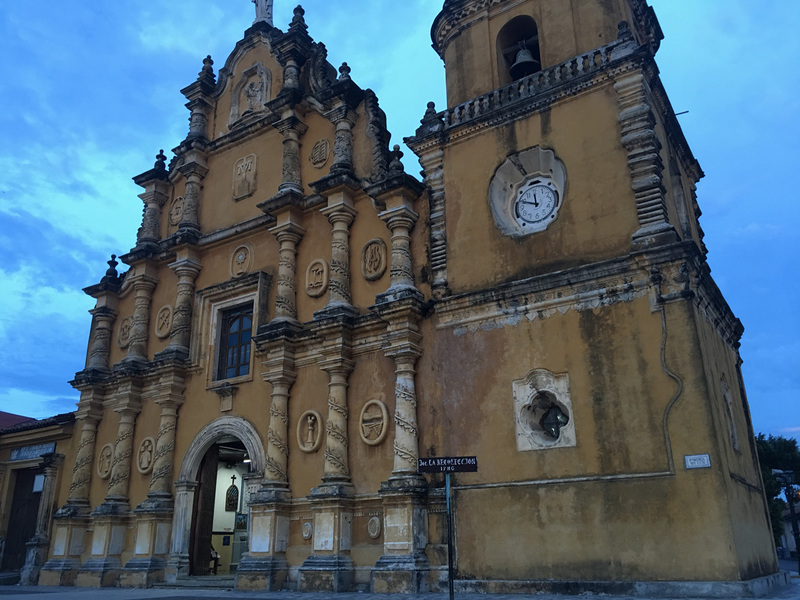 Day 23 to 26 - Guatemala - Antigua, and an Explosive Encounter! Les 12 travaux d’Asterix pour ces passages aux différentes douanes.. Tu es courageux. Heureux que tout se passe bien. C’est très intéressant de lire ton récit. Effectivement, mais vaut mieux en rire que de s’en faire avec ces absurdités bureaucratiques n’est-ce pas! Je m’appelle Martin, un québécois parti une année en Asie oceanie pour voyager. Je suis présentement à Bangkok. 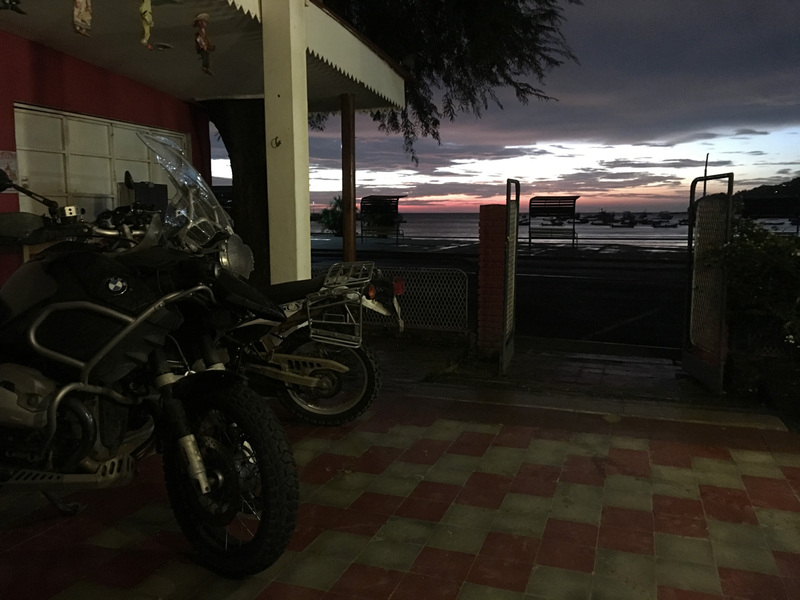 Je suis tombé sur votre blog par hasard hier en faisant des recherches sur la bmw ( ma moto de reve pour partir à l’aventure). J’ai lu vos aventures depuis votre départ en une soirée ( je me suis couché très tard!). Super récit et superbes photos,merci de partager! Je continue a vous suivre avec grand intérêt. C’est un honneur de t’avoir à bord! L’Asie sera mon prochain objectif. Je n’ai jamais eu la chance (courage?) de m’y aventurer. As-tu un blogue pour suivre ton parcours? Merci, en direct du très vert Costa Rica! 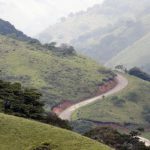 Je considère qu’écrire un blogue intéressant demande un talent d’écriture que je ne possède pas, mais j’admire beaucoup les aventuriers qui ont la générosité de partager leurs voyages , leurs conseils et parfois aussi leurs mésaventures! 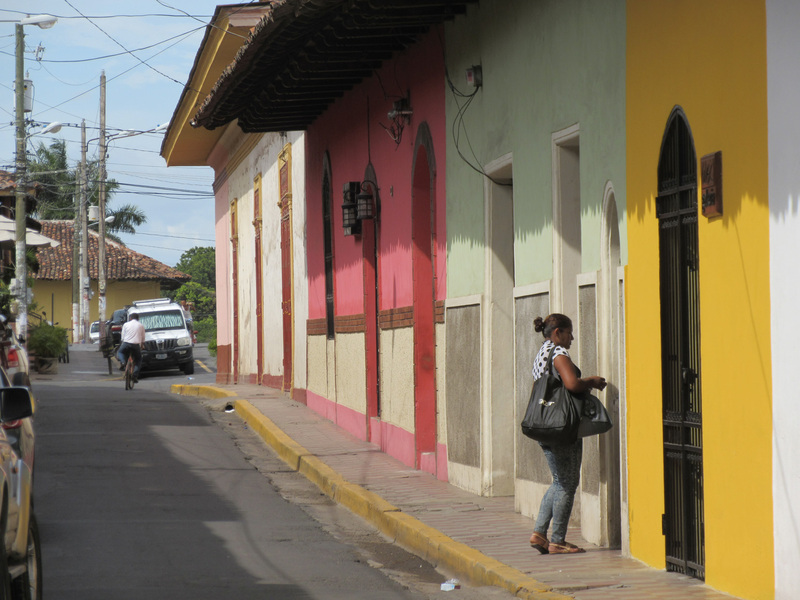 Was there any discussion about the Chinese building a canal through Lake Nicaragua? Looks like we stopped at a lot of the same places along the way. Great memories being relived while reading your blog. Happy you enjoy it and that it makes you travel back in time! 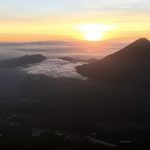 My name is Vesselin (Vesso), a rather rookie rider who found your blog some hours ago. I have been reading the whole thing in one go…you have done a fantastic job! I got stuck at days 26-30 as I do not find an English version of this chapter from your journey. My French is = 0, unfortunately. I will skip it and keep reading forward hoping I can get back to it at some point if an English version is posted. Best regards from South-East Europe (Bulgaria) and wishing you many safe and exciting miles ahead! All the posts are both in English and French. There seems to be a bug with this one. I’ve corrected. Let me know if any other ones are only in French!